Library Journal "Best Reference Source, 1998"
Booklist/RBB "Editors' Choice Reference Source, 1998"
New York Public Library "Best of Reference, 1999"
The science, history, and culture of tropical cyclones around the globe have evolved considerably since the publication of the award-winning first edition of Encyclopedia of Hurricanes, Typhoons, and Cyclones 10 years ago. Improved forecasting techniques, new naming systems, and heightened intensity and duration records are only a few of the changes that have taken the meteorological world by storm in recent years. 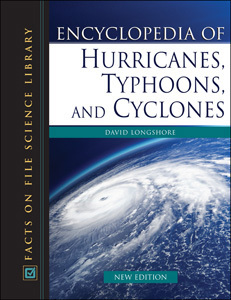 Encyclopedia of Hurricanes, Typhoons, and Cyclones, New Edition features significant updates and information on recent weather phenomena and the devastation and loss that often resulted. Hurricanes Andrew, Dean, Felix, Gilbert, and Wilma are covered in detail in this comprehensive reference, as well as the most destructive and deadly tropical cyclone witnessed in the United States in the last 50 yearsHurricane Katrina. As the historic and vibrant city of New Orleans continues to rebuild and reconstruct in the aftermath of this hurricane, national meteorological agencies and research institutions suffer from the deadly effects of under-funding and political neglect. Between 2005 and 2006, hurricane-related damage in the United States totaled $168 billion, and nearly 1,500 lives were lost. This completely revised edition features more than 80 all-new black-and-white photographs and line illustrations, a revised introduction, historical and cultural entries, extensively revised front and back matter, a bibliography of print and Web resources, a chronology, and an index. "...a fact-filled work with articles that are informative and accessible to both student and lay reader...a reasonable and worthwhile investment for both academic and public libraries...larger libraries may want this title for their circulating collections as well." "The entries in the encyclopedia make great reading...has considerable merit and most libraries will want to purchase the volume for their reference collections." "...a strong pick for any collection strong in weather science at the high school or college levels."